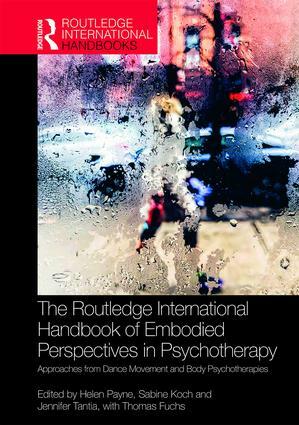 In The Routledge International Handbook of Embodied Perspectives in Psychotherapy, world leaders in the field contribute their expertise to showcase contemporary psychotherapeutic practice. They share perspectives from multiple models that have been developed throughout the world, providing information on theoretical advances and clinical practice, as well as discourse on the processes and therapeutic techniques employed individually and in groups. Presented in three parts, the book covers underpinning embodiment concepts, potentials of dance movement psychotherapy and of body psychotherapy, each of which is introduced with a scene-setting piece to allow the reader to easily engage with the content. With a strong focus on cross- and interdisciplinary perspectives, readers will find a wide compilation of embodied approaches to psychotherapy, allowing them to deepen and further their conceptualization and support best practice. This unique handbook will be of particular interest to clinical practitioners in the fields of body psychotherapy and dance movement psychotherapy as well as professionals from psychology, medicine, social work, counselling/psychotherapy and occupational therapy, and to those from related fields who are in search of information on the basic therapeutic principles and practice of body and movement psychotherapies and seeking to further their knowledge and understanding of the discipline. It is also an essential reference for academics and students of embodied psychotherapy, embodied cognitive science and clinical professions. Helen Payne, PhD, MPhil; UKCP Reg., ADMP-UK Reg., is Professor of Psychotherapy, specializing in dance movement psychotherapy, adverse childhood experiences and medically unexplained symptoms, at the University of Hertfordshire, UK. Sabine Koch, PhD, MA, BC-DMT, is a psychologist and dance movement therapist. She is director of the Research Institute for Creative Arts Therapies at Alanus University, Germany, and Professor of Dance Movement Therapy of the Master Program at SRH University Heidelberg, Germany. Jennifer Tantia, PhD, MS, BC-DMT, LCAT, is a somatic psychologist and dance movement psychotherapist, specializing in trauma and medically unexplained symptoms in the US. Dr. Tantia is former chair of the United States Association for Body Psychotherapy research committee and currently serves on the board of the American Dance Therapy Association as chair of Research and Practice. Thomas Fuchs, PhD, MD, is Karl Jaspers Professor for Philosophical Foundations of Psychiatry and Psychotherapy at the University of Heidelberg and the Psychiatric University Hospital, Germany.